How wonderful to arrive in Hong Kong and find an excellent Australian television channel available. 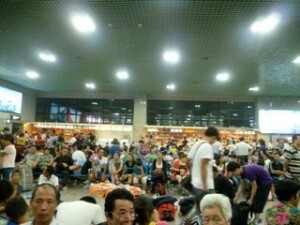 It is that feeling of getting closer to home that will sustains me during one month in China. 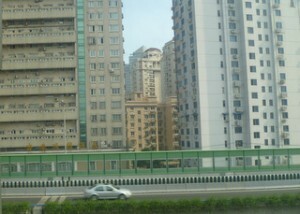 Having taught many Chinese students, it is appropriate to see how they live in their own country. Will China ever become a country of migrants? In Italy, for so long a people exporter, the Chinese are becoming ever more apparent, running shops and offering services. There is no doubt they will run circles round the Italians. 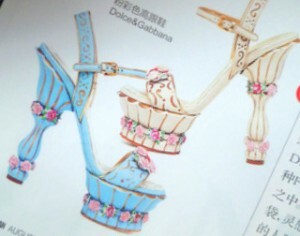 It is just a matter of time before the Chinese start expressing themselves in more impactful ways. However, a fellow traveller said he can’t believe how much more colourful and happy China is now, compared to the 1970s, when grim expressions and Mao suits were the norm. Are the Chinese still inscrutable? The Chinese are both tougher and softer than I’d expected, but in different ways. Tougher just to persist as they do in a massed society, crammed into their super metro (12 lines or more, all pretty new) and taking a few minutes just to get onto the escalator. Their love of and encouragement of their adorable children is dazzling. 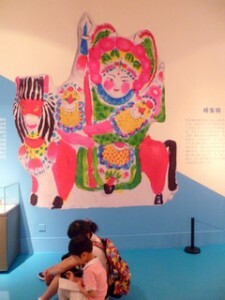 An exhibition of traditional toys in Beijing was filled with parents and kiddies drawing the displays. Title: Great Success Comes from Playing. 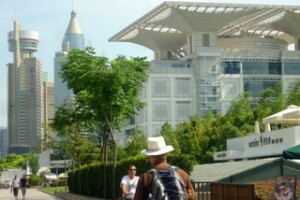 Who designed all these futuristic buildings in Shanghai? 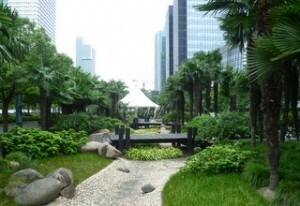 At least they have recognised the importance of open space and greenery. Their publicity photos and ads all feature natural beauty prominently. And you have to respect a country that has neat free public toilet blocks with good signage every couple of hundred metres. The Metros and streets are always clean, or someone is busy getting them that way. As a command economy (and a police state) China could make many more leaps forward towards solving their environmental and economic problems. One glaring issue is the still closed nature of their society. It is not tourism friendly, with few English or European language speakers, and little information in English. We got our money back after entering the interesting looking science and technology museum in Shanghai because none of the exhibits had English info. Going out on my ethno-centric limb now, I believe that the Chinese writing system creates a cultural barrier equivalent to their Great Wall long ago, and just as self-limiting. There is an element in the Chinese that doesn’t want a more diverse, receptive population or visitors. Heaven knows they have enough to deal with as is. Why are the English translations in China so quaint? There is a truculence as well as some charm in the peculiar ways they provide captions and signs in English. And good luck trying to find any foreign language media, written or electronic. Haven’t they asked a true bilingual to do a quick edit? Ever? But think of how Attaturk brought in a phonetic system to Turkey, and they haven’t looked back compared to countries with Arabic script. Imagine if the Germans, out of misguided pride, insisted on only using their Gothic script. Or think of the Japanese, stagnating along, still a closed shop. A phonetic system would give me a handle on how to communicate, and make it easier for Chinese to pick up a bit of English. Such are the musings of an overwhelmed and respiratorily challenged visitor. In two weeks I’ll be happily home. Rhonda I like the Chinese too.The Western Oligarchs have become too arrogant in asserting their “New World Order.” A faltering Western economy is trying to contain China via cutting off energy and resources. This is the recipe for WW3. You were lucky. I cruised the Pacific for 35 days out of Sydney on a cruise ship with 2000 other passengers, mostly Australians. Not one word of news from Australia. Plenty of American sports, news, and soapie re-runs. We wondered if Australia had dropped off the planet.